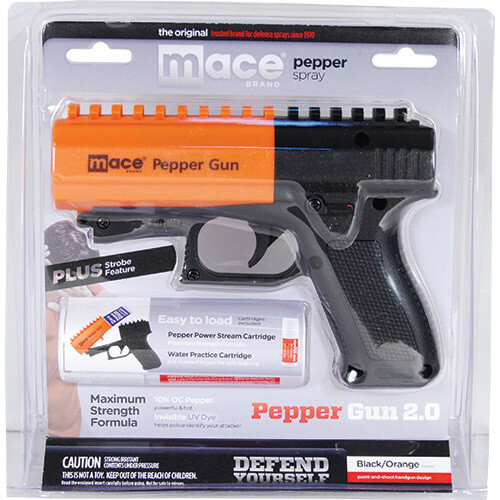 The Mace® Brand Pepper Gun® 2.0 provides distance defense with convenient point-and shoot accuracy. DUAL MODE LED light distracts your attacker and helps aim at your target in the dark. Engage the trigger once to activate the steady LED flashlight feature. Engage the trigger a second time for the pulsating LED strobe. Comes with an OC Pepper Cartridge and a Water Practice Cartridge. Integrated Picatinny rail allows you to attach accessories to your Pepper Gun. (3) x 1.5V AG13/LR44 batteries included.